Nokia to Launch Windows 8 Microwave! Staying Connected - thanks to your microwave. Samsung predicted that the next big thing would be Android on your refrigerator Apparently, that's so 2012. This year, Nokia is preparing themselves for the next trend in consumer electronics - Smart Microwaves. The microwave might just have been one of the most boring appliances in the home kitchen, but now, the Nokia 5AM-TH1N6 Constellation will completely redefine what it means to be a microwave. It comes in three colours: Blue Cheese Cyan, Lemon Yellow, and Liquorice Black. Similarly to current touch-screen technology, the Nokia Constellation features a touch screen, which can be operated with oven mitts on! Put anything inside the gigantic 40-litre microwave and choose from one of twenty-five preset performance levels! Many of us enjoy eating those TV dinners from the grocery store, but we often hate waiting minutes for the food to cook. That concept is thrown completely out the window the Nokia Constellation. Just how? This state-of-the-art microwave features a 8-core liquid-cooled transformer, giving 5000 watts of power! Using this advanced technology, food can be prepared in a few seconds! Another feature of the microwave is its eye-tracking technology. Whenever you look at the food, it will stop spinning, allowing you to inspect its cooking progress, similar to Samsung Smart Pause. Also, depending on how hungry you look, the microwave will modify its temperature accordingly. 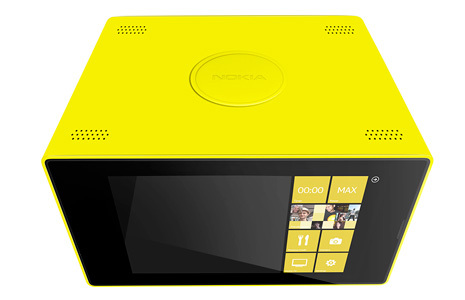 Just in case you couldn't fit this microwave in your kitchen, Nokia is preparing a "mini version" and a ten-inch variant. The 40-litre Constellation will release Q2 2013, at a MSRP of 399 Euros. Happy April Fools' from Nokia!